To round out 1986, we completed two house fragments–the Shelburne and Shoalwater Kitchens, named after two Seaview, WA inns. These were smaller pieces than usual, but labor intensive—the women commissioning these projects were our two best and most supportive customers. While we toiled away in miniatures, the world at large was even busier—in 1986 the US bombed Libya, Reagan sold arms to our arch enemy Iran. We lulled ourselves with Magnum P.I. and the Cosby Show, and ached for the victims of the Space Challenger and Chernobyl disasters. We gassed up at .89 a gallon, sent our first emails, and took our first airline flights free of cigarette smoke. The Shelburne photos remind me how we were winding up our stint with Victorian architecture. Over the previous 12 years we had developed a vocabulary of elements that we moved around for each new project—the designs in the chimney brick, the inside/outside drawer for stove wood, bracketed, generous overhangs on the porch, drop siding, and aged cement foundations. Each element became a word or phrase that formed the whole story of a structure and our signature style. I am pleased to see these kitchen are a prime example of our work, and don’t reflect our not-too-underlying desire to move on, to try out new dialects, and maybe a new language entirely. 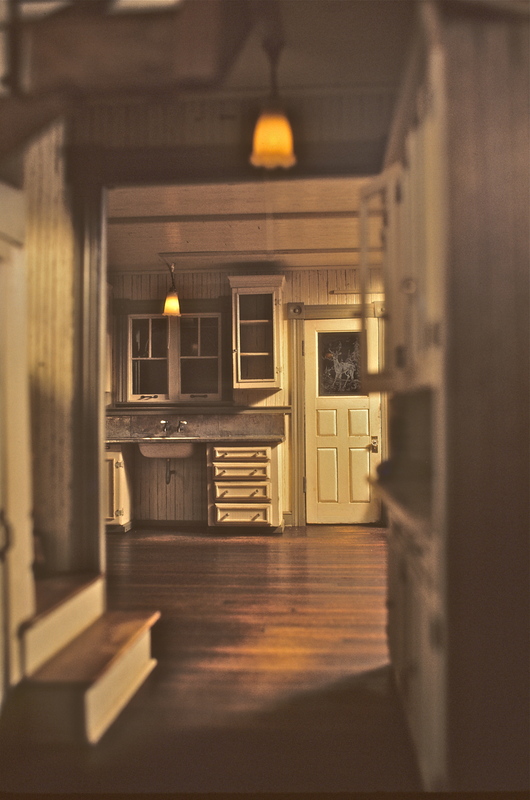 The customers, two collectors, who often carried on a friendly but ferocious competition at miniatures auctions, each wanted a kitchen fragment, an expanded version of our small kitchen fragment, the 1983 North Cove kitchen. They agreed to have similar smaller pieces built. So as not to have to design two different structures, Noel designed one, then flipped the design for the second, so as not to make exact duplicates. We changed paint colors, in and out, and a few other details, but memory fails me as to the particulars. There was a drawback in building two at once. The idea of ganging up our work to save time (twin houses presumably would go faster than two different designs) had never appealed to us. Our friend Jim Marcus believed in building what he called editions of houses—setting up jigs to use on 2, 3 or more of the same piece, and enjoying the process, but we weren’t cut out to be jig people. We did it with our chairs and garbage cans, and found the assembly line aspect bored us to tears. It just wasn’t worth the time saved. Plus, on a structure, we enjoyed the discovery of each piece of the puzzle, or at least how it fit in a new setting. Repeating ta puzzle once you know the answers is no fun. This time expediency won out over fun—we brushed off our Victorian vocabulary and started in. But there is the good part–the payoff for building a fragment is that you get to put a few evocative rooms into a small structure. 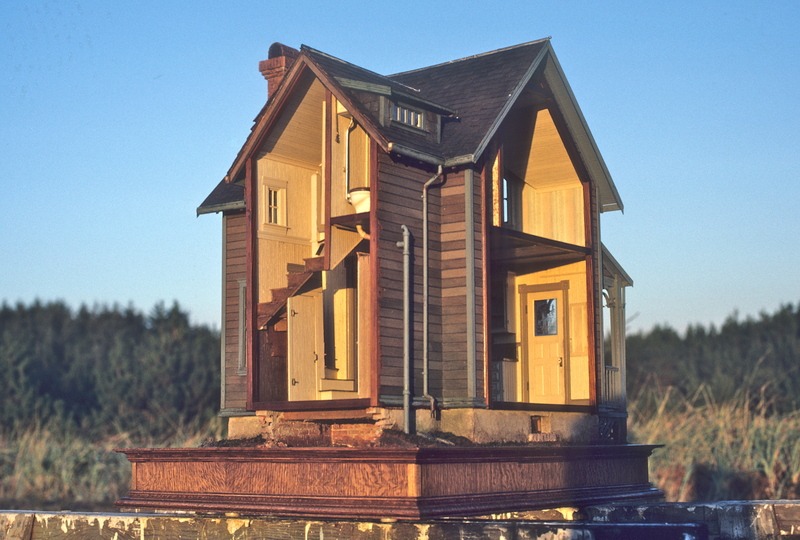 For me, this Reader’s Digest version of a dollhouse is much more intimate than a larger structure. In this case the fragment was a large kitchen, butler’s pantry, with a winding staircase, leading to an attic room/maid’s quarters and tiny bath above. Functional, but reminiscent of kitchens past, cooking, and family gatherings. Your mind can get lost in it. Much of the design stemmed from a similar setup in my grandmother’s house—something I must have nudged forward unconsciously, or not. I remember being thrilled to reach an age where I got to spend the night in that tiny room over the kitchen. Once we got into the work, the story developed, and we became totally involved. Thomas quirks like lots of plumbing pipes are evident, along with the break-away walls that would have been attached to the rest of the house. Noel loved making drains and vent pipes (dowels), with elbows (wrapped with narrow strips of masking tape and painted to look like connectors). Our vocabulary for any style included the cobby dust (thank you dear resident flock of baby spiders) that gathers between interior and exterior walls. Such utilitarian but important details, or phrases, add to what we called the reality of illusion, and were always a hit with the men viewing our houses. Handymen or not, guys seem to like plumbing. Maybe a way to enjoy miniatures without feeling silly. I‘ve combed our picture albums and boxes of slides, but can only find photos of the Shelburne. It’s mysterious–maybe we thought that with twins we could save film and only document the one? They weren’t exact twins, maybe fraternal, but you’ll just have to take my word for it. 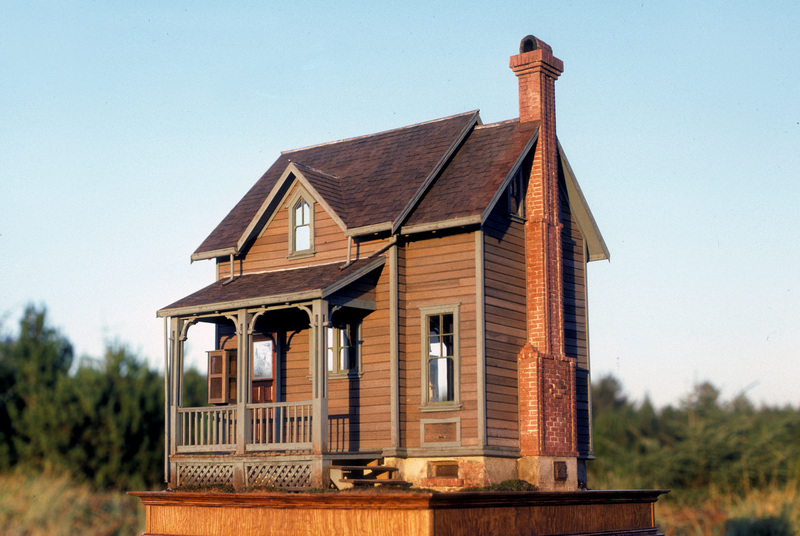 Today one resides in the Kansas City Miniature and Toy Museum, the other in a private collection. 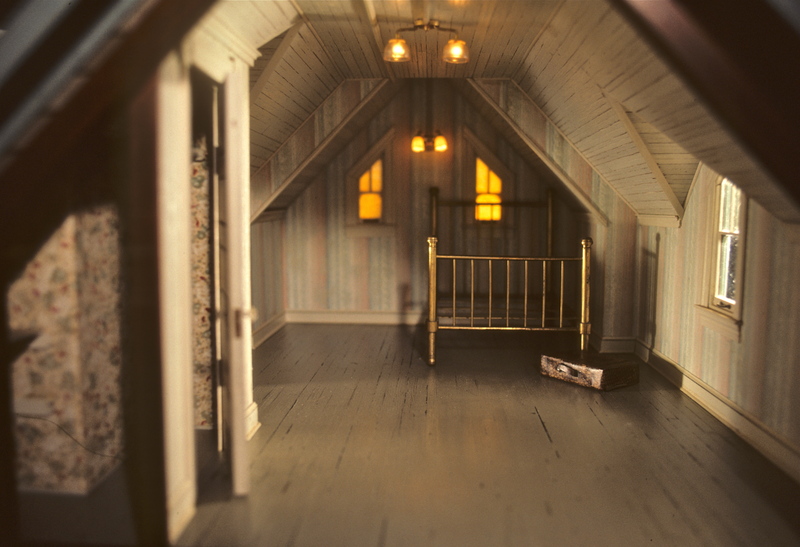 This entry was posted in Houses, Memoir, Miniatures and tagged dollhouses, kitchens, miniature kitchens, Victorian architecture. Bookmark the permalink. April the Shelburne Kitchen is so wonderful. Must be one of my favorites. Of course I think each one is. But this one is absolutely delightful. Thanks for sharing. Every time, I get goosebumps looking at your houses. So amazing is the realism that the last shot of Noel looks like “Land of the Giants”!!! Thanks, Linda–you’re a faithful reader! of the wire frame box that has the small door into the kitchen. Beautiful work! The wire box is a pie cooler, where they kept pies, milk and other items cooling in the outdoor shade, before refrigeration. A detail still found on the old beach houses on the WA coast. Such beautiful work! I love the high-res photos you include. I enlarge each one as big as it will go, then carefully pore over each detail. You guys are truly “grunge artists”!! What’s amazing is that a lot of our photos aren’t that great, but wordpress, the blog sponsor, has just recently added extra hi res to the format, and it seems to transform even poor quality photos. I’m new to miniature building and I must say that I am overjoyed finding your blog and photos of your work. It’s funny that while I read your blog on the one hand I feel daunted (I’ll never make something so convincing) then I am being totally inspired (masking tape for elbow joint! that’ll do it!) to push on. I also enjoy how you put your work into a historical context so we can actually place the building of it during a specific time period. Perhaps it’s a shame you don’t have more fotos but honestly, the text paints a perfect picture. Thanks for a wonderful piece. Peggy, It’s music to my ears, especially when “the text paints a perfect picture,” as writing is my true love. 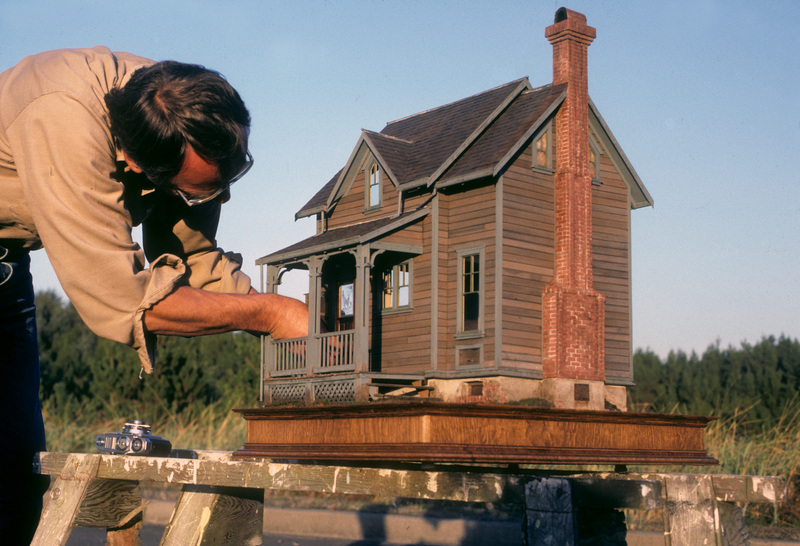 As for miniatures, there are so many ways to make it work without a lot of power tools or specialized knowledge–it’s all in your imagination. Have been in awe of your work FOREVER. Glad to hear you’re enjoying it, Lorraine. I saw the one in Kansas City…unforgettable. It is truly one of the best and most beautiful houses in the country.